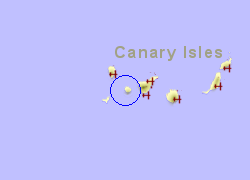 Each of the Canary Islands has a very different character and this is shown in the Garajonay National Park, extending to 3,984Ha, on the Canary Island of La Gomera, a leafy forest that is often shrouded in mist. This mist together with numerous springs and streams provide the moisture that maintains the laurel (covering 70% of the park), white heather, strawberry tree, and many other species on this landscape which is less obviously volcanic than some of the other islands. 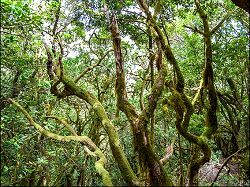 The beauty of the park is the naturalness, the feeling that you are seeing ancient woodland as it would have been a long time ago, and it is home to a number of endemic species of animals. Garajonay was declared a national park in 1981 and a World Heritage Site by UNESCO in 1986 and is a rare example of laurisilva, a humid subtropical forest, that in the Tertiary period (the period running upto the last ice age, 1.6 million years ago) covered almost all of Europe. 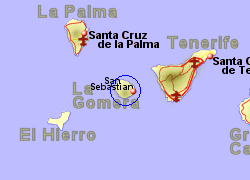 The National Park is easily accessed from anywhere on La Gomera, the island itself being accessed by ferry from the south of Tenerife or from La Palma. 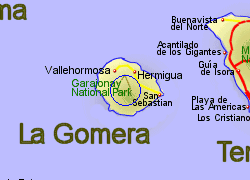 Map of the Garajonay National Park area.